Embrace your true potential as entrepreneurs. Fatima Williams , As a purpose driven strategist I help you recognise your true potential and embrace yourself! The Article Women Entrepreneurs 2018 Challenges had us all thinking. Why aren’t more people doing this? My answer – “Let’s start with you and me!”. I share some amazing tips from entrepreneurs I admire on overcoming these challenges. This series Episode 1 – To Raise Awareness Among Women on How to Start their Journey as an Eentrepreneur. We have to let go of the orthodox conditioning that we are meant to be only employees and live life to the fullest. Self-Confidence, Motivation, Inspiration help one develop and grow as an Entrepreneur. It’s about recognizing an opportunity, looking at things going on around you and thinking of something that could be done. Something out of the box. Out of the ordinary. Maybe a simple idea as well. It might be a new product or a new service but it’s about spotting an opportunity in the marketplace. Often, it’s the most simplest of ideas that really take off. When somebody looks around and see something that’s accepted as the norm and they think there’s a diverse way of doing it. As a part of my upcoming series on – “How to grow as an entrepreneur”. I am talking to leading and inspiring women entrepreneurs all over the world. I welcome men who support Women Entrepreneurship to be a part of this series as well. This is about raising awareness. Women need to take the entrepreneur baton in their hands. Do you agree the baton has to be passed on? The 1st entrepreneur on this series is Laura Staley, Founder of Cherish Your World and she passionately helps people thrive. Laura started her entrepreneur journey in 2004 after a flood in her finished basement. A realization that she could live with belongings she loves and not hand-me-down stuff she didn’t need. A purpose driven entrepreneur who empowers people and a mother of a loving son and daughter. She has graciously agreed to be part of this series. Laura answers a couple of questions on her journey to help people thrive. 1.Do you agree the baton has to be passed on and why? Yes, the baton needs to be passed on because each person has an opportunity to live true to their deepest calling and purpose. Each of us has unique gifts, talents, life experiences that when shared can bring value to the lives of others. We are meant to shine brightly in the world. Some may choose the path of becoming an entrepreneur. I honor all the different choices people make and it can be exciting and nerve-racking to actually listen to your heart, intuition, and soul. 2.What advice would you give women who want to become entrepreneurs? Do what you love, live true to your gifts and talents. Listen to your heart because the heart knows the answers. Identify what you love so much that you will jump out of bed every morning excited for the day and all the challenges. What is that “dream that will need all the love you can give everyday of your life for as long as you live?”-Rogers and Hammerstein What is that dream? Keep going, responding, and making lots of mistakes, and be willing to learn and keep taking inspired actions. Surround yourself with good, wise people who really believe in you and will be supportive and honest with you. Grow deeply in self-awareness. 3.You have an idea, you want a business you want to start up, how do you go about doing it? My pathway was truly unique in that I just kept taking inspired actions after my “AHA” moment after the flood of my finished basement. If you have identified a clear passion, a way to serve others, or a product that brings joy and value, take small steps everyday to bring it to life. Share your idea with trusted others. If you need training, get training. Reach out to others for support in the areas that are not your strengths. Be willing to stretch outside your comfort zone and learn. Keep being brave, network, and ask questions. Keep being willing to grow, adapt, and flow. There are many people willing to help and guide…Ask for support! 4.You’ve mentioned quite a few things there what else would women specially need; can you tell us one crucial thing they need to develop as an entrepreneur? One crucial thing women might need —I think a great deal of self-awareness, emotional intelligence, and unwavering, unstoppable inspiration, determination, and tons of courage. Not everyone may agree with you and some may be threatened by your sense of empowerment and your passion. 5.And what about when it comes to actually pitching your idea to somebody or getting investors behind you? I began by excitedly sharing with friends and it grew little by little each week. In 2015 I reached out to many people when I knew I was all in. I networking and sharing my vision for people to create homes they enjoy and lives they love. 6. And what about risk? As an entrepreneur are you the type of person that’s takes risk? How do we tackle these risks? Most of my life I have learned to take risks and have made choices with which others did not agree. I’ve learned to “brave the wilderness” as Brene Brown states it and muster the courage and tenacity to keep going. I made and will make lots more mistakes, but I’d rather stretch myself into the unknown than live a half-lived life. The words of Brene Brown inspire me to be brave and vulnerable. It’s terrifying at times. Daily meditation, exercise, and focusing on gratitude supports me immensely. I tackle the risks by going for it, adapting, responding, taking full responsibility for my miscues and missteps. Apologizing, working to make it right if I can, and forgiving myself. Holding compassion for myself and others helps a great deal. We are all on different journeys learning different lessons. I also notice there seems to be this blend or flow between strategic planning and intuitive adapting. I have found its helpful to ask what’s working and what’s not working and what could be utterly different. My focus is on the client or the participants at a talk and how I can best serve them. What value can I bring to the table? What fresh perspective can I offer? Can I listen more and talk less? Can I ask more questions? Most definitely. Will another person breathe easier because I lived or be moved by those stories and experiences? I hope so. 7.One thing that I’ve always noticed about any entrepreneurs or business people that I’ve interacted with is confidence, what your golden advice on keep that light burning. At times I have struggled with confidence and self-sabotaging behaviors because I didn’t think I was worthy of being here. I had a metaphorical “flapping umbilical cord” and was searching desperately for belonging, acceptance, and love. I faked confidence and lived with yearning and terror inside of me. Years of book reading, personal growth, therapies, transformational/leadership/emotional intelligence workshops all supported a coming home to my own soul, in my bones an experience of belonging to myself. I’ve lived through many life challenges that have shaped me, but haven’t defined me. I tap into Maria, the character from The Sound of Music, and “I Have Confidence” and the song “Titanium” to keep the light burning in the realm of confidence. I’ve lost many people to death and almost lost my son twice. I work to keep it all in perspective. My son now thrives, and I am so grateful. 8.Thank you, Laura, for sharing those personal challenges as well. I admire your Courage. Last question here, please tell us one book, movie or role model who changed the way you looked at things in life. Maria from “The Sound of Music” will forever be my role model for exuberance, unwavering passion, determination, ingenuity, courage, and vulnerability. This movie continues to inspire my own life journey. I found my passion and sacred livelihood for a lifetime after reading Terah Kathyn Collin’s book The Western Guide to Feng Shui. This body of wisdom continues to transform my life. I’m forever grateful. Thank you, Laura, for being you, please continue to empower and inspire Women to take the baton! Once you believe in yourself and what your putting forward to the world people will automatically believe in you. 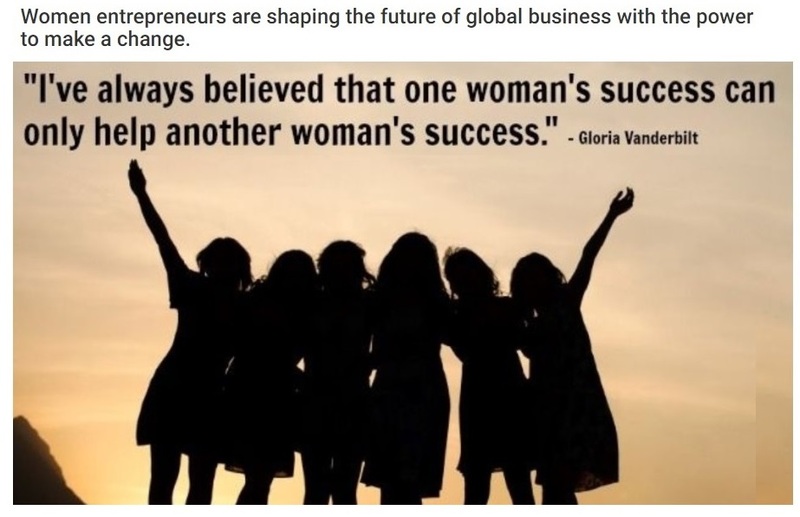 Thank you for reading this article I look forward to your comments on this series on The Women Entrepreneur Journey! We can all form our own support groups to help each other shine. Are you ready to pass the baton? I am a brand ambassador, an ardent reader, a Purpose-Driven Career Strategist and HR. My passion is to help create a purpose-driven world around me. I encourage women worldwide to recognize and embrace their true potential as entrepreneurs and believe in themselves.